A survey enables to compose a comprehensive archaeological knowledge of a certain region by giving it contextual data. The vegetation and climate, and possible economic resources in the region can be observed. Furthermore, the relationship between human beings and nature/landscape is best discerned through such investigations. Walking between clarified premises, an archaeologist can have all surviving information on the planned location, and can attain information pertaining to the periods which are missing in the ancient cities. Historical records about Labraunda are numerous, but usually written by the perspective of the Greeks and centred on the hellenistic/roman periods of the site. These written sources do not provide much information for the pre-Classical and late-Antique periods. 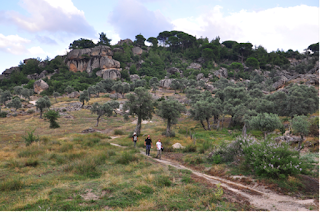 However, we know that Karia was a cosmopolitan and culturally rich region in Anatolia. There is change which scholars can observe and there is continuity in many aspects in the region. In order to have a general understanding of the region, a survey was required. The Labraunda survey project started in 2017. It aims at creating an archaeological map of the region within a 10 km radius surrounding the site. In 2018, our team investigated in and around many villages and towns, interviewed local people, went to isolated places in order to prospect ancient material hinted by the locals, analyze and scrutinize ceramics, walls and tombs. In order to document the ancient remains, we took aerial pictures with a drone to produce local maps, drew and took pictures of landscapes and objects. Remains were also recorded via GPS. The survey started in a village called Sarıkaya. The village is located on the slope of a hill with a lot of gneiss rocks that got formed in the last ice age. A lot of them fell down in the valley as a result of the ice-melting incidents in the aftermath of the Ice Age, and through such violent tumbles, these rocks got shattered into pieces which look very particular, as if they got cut artificially. Immediate behind this village, there is a slope which has a large assemblage of these rocks, and a lot of them carry rock-paintings dating to the Chalcolithic period. Most of these paintings show human figures. Women are depicted with large hips and breasts (possibly arms), while men are represented with tall body, ‘M’ shaped arms and extended legs. 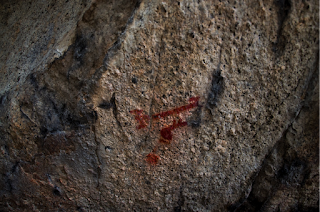 In the Latmos Mountain (Beşparmak Dağı), which locates 40 km north-west of Labraunda, there are many examples of these rock paintings and Sarıkaya draws a parallel to them (http://www.latmos-felsbilder.de/01.php?l=eng). 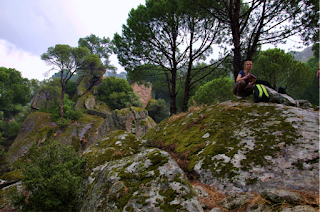 Down in this valley was a Hellenistic village with an olive press factory. 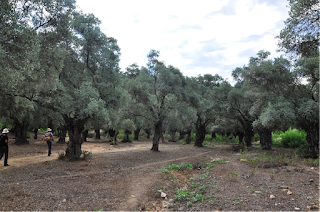 As in many other places in Karia, this valley was incredibly rich with olive, fruit and wine trees. Also, a stream coming from high plains has fed this area up to modern times which paved way for a good agricultural environment within this area. We made a map by using photogrammetry method which uses large numbers of photos taken from different spots within a fixated area. 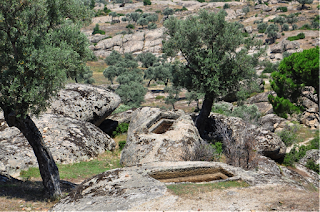 In the remaining 10 days, we went to several ancient locations having numerous olive presses, tombs and some even fortification walls. There were some domestic buildings as well, yet they did not provide much information since the only surviving feature of these buildings were the foundations. The most remarkable aspect of this survey for me was the continuity of economic resources and recently made drastic changes in this area. From historical resources we know that Karia was an economically important region with its abundant resources of olives. Industrial machines replaced olive press in the 20th century and these ancient olive presses are out of use now; but the immense amount of centuries-old olive trees around these olive workshops still feed the residents of this region. This resilient type of tree does not require a lot maintenance, but it generously rewards the beings around it by its energy-rich, healthy nutrients. The ancient owners of this area built their monumental tombs within these olive gardens, around the workshops. They were carved in bedrocks which usually had drastic views over the landscape. 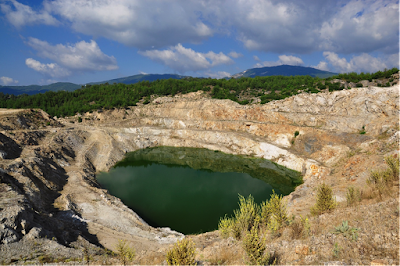 The exponential augmentation in industrialization and urbanization in Turkey affected Labraunda greatly as well. First of all, the villages have now a very small amount of people since the youth move to the cities. Secondly, construction sector in Turkey became tremendous, and there is immense amounts of quarries eating down the mountains to meet the material needs in the country. Being a region extremely rich in feldspath, a very large areas surrounding Labraunda are being exploited. The course of rivers changes or fade, and some zones on the plain get deforested even though the trees yield profitable harvests. The changes caused by these factors are great, and probably irreversible. I think it was also important to witness and document this shift in the region. Even though archaeology is the ‘knowledge of past’, current mentality in archaeology dares to deal with “here and now” as well, instead of the only “there and then”. The processes people have in history is inseparable. The relationship between people and nature is always dynamic and thus a subject to the archaeology. The Labraunda Survey Project was a great opportunity to have witnessed the existence of ancient roads, workshops, villages and towns, shelters which provided information about the economic, political and social aspects of this region from Prehistory up to modern day.